Fig. 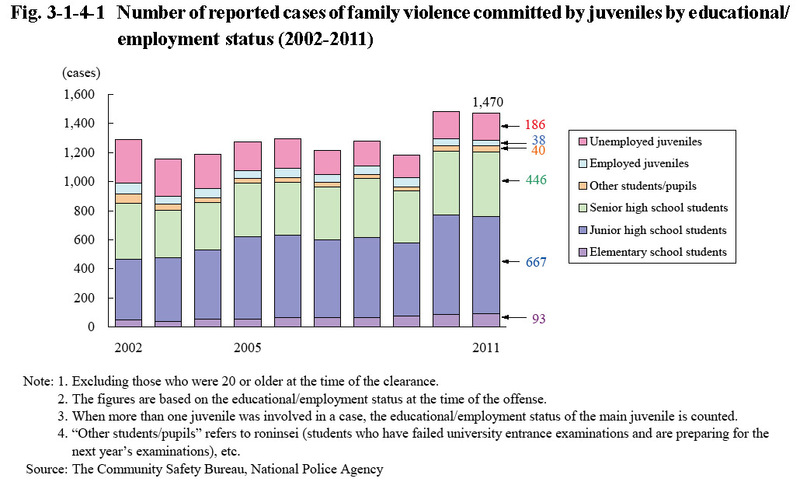 3-1-4-1 shows the number of reported cases of family violence committed by juveniles by their educational/employment status over the last 10 years. The number remained within the range of 700 to 800 in around the early 1990s, but then continued to exceed 1,000 following a sharp increase in 2000, and was 1,470 in 2011 (down 0.9% from the previous year) (See the Appendix for details). By educational/employment status, junior high school students accounted for the highest proportion every year, at 45.4% (667 cases) in 2011. With the targets of violent acts in 2011, mothers accounted for the largest number at 913 cases (62.1%), followed by household goods, etc. at 215 (14.6%), other relatives living in the same household at 121 (8.2%), fathers at 115 (7.8%), and brothers/sisters at 95 (6.5%) (Source: The Community Safety Bureau, National Police Agency).